"Narrow slits fitted with fine lattice-work did duty for windows, and the smoke of the turf or wood fire lit in the idle of the floor, found its way as best it could through the thatched roof. The peasant seated on a rude bench or log of wood, ate his meals at a rough-hewn table, from wooden platters, with a wooden spoon, and slept off the fatigues of the day on a bed of straw, with a log for his pillow. His food was mainly bread, oatmeal, porridge, and milk. Common vegetables, such as cabbage, onions, carrots, etc, were imported luxuries, whining reach only of the rich; and potatoes and groceries were unknown." 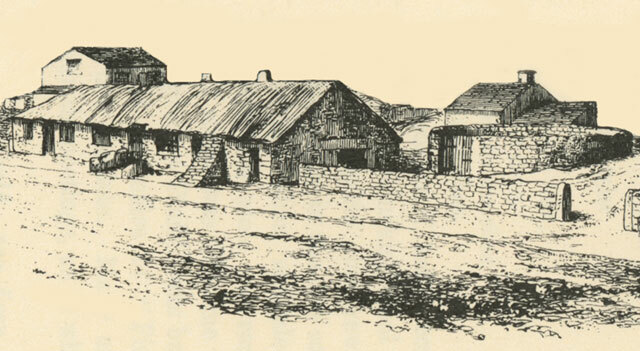 In the post Elizabethan era the peasant home was: ..."
built of stone or brick with chimneys. Pewter vessels replace wooden ones and feather beds and pillows replace straw." 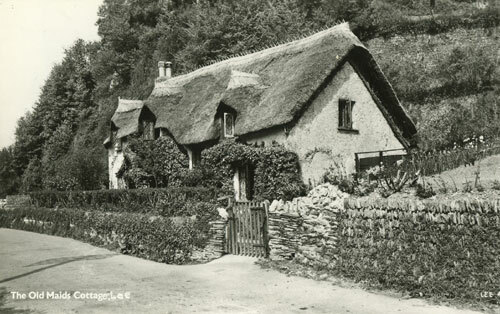 Cottage of the working class were generally one story with thatched roofed. The floors were uncarpeted brown stone. The cupboards had no doors. Open shelves hug over and/or under the sink. Extended families tended to live near one another. Every cottage contained a "delph case with its treasure of clean plates and other articles of crockery" and "drawers with their white cover, on which family Bible, hymn books and sundry articles of crockery were placed" as well as a "shut-up bed" long seating (wooden benches) and a "bread creel" (which was something that oaten cake was laid on to dry). "....one storied, straw thatched, and doubled roomed, containing house and parlor only, perhaps it is two storied as cottages are made now. If the latter, there would be a house, a sink at the cellar head, and a bedroom above. This latter room would be open to the slates with no ceiling or underdrawing, to hide the black and dark look of the upper parts. Nor would there be any ceiling for the lower room, the bare underside of the bedroom floor would be exposed. The walls of the rooms upstairs and down would be covered with a wash, the house walls would perhaps be tinted yellow or amber; the walls of the bedroom, for variety, would perhaps be white or sky blue. 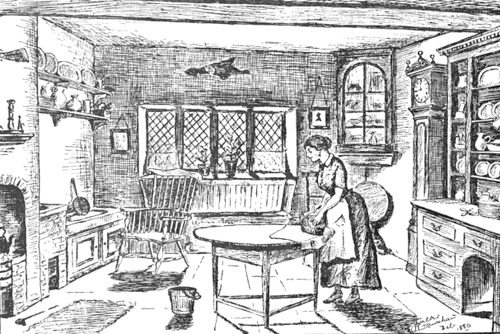 Papering was then a thing unknown in the working man's cottage, as were wailings to living room and bedroom." 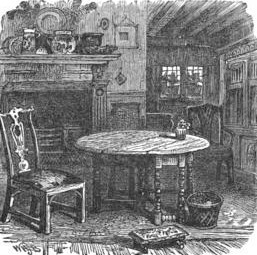 "The old are chair, the three-cornered cupboard in the corner, the copper kettle hung on the "balk", the flowers in the old fashioned widow bottom, the samplers on the walls, the little "silhouette" portraits in rosewood frames, the framed funeral card, by their side, the brass candle sticks on the shelf over the fireplace, the old Italian iron near, are all gone; their departure is simply a matter of evolution"
Skilled artisans apparently enjoyed some modest comfort at home. Their cottages were larger and often in better areas of the town than those of the laboring poor. There was usually a small yard at the back, the windows were often well proportioned, and the doorways showed some signs of simple elegance. Inside the furnishings were usually comfortable, an contained something beyond the basic necessities of bed, table and chairs. Such things as clocks, pictures, books, ornaments, floor coverings, oak or mahogany chests of drawers were taken as signs of decency and prosperity. 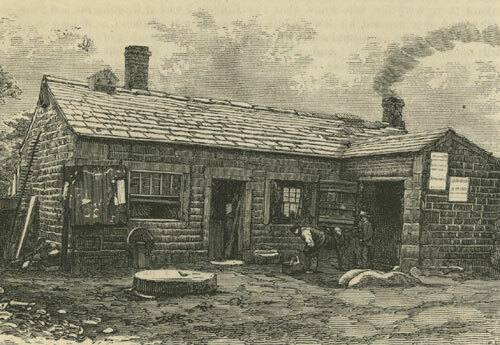 In the 1870s the English workman still lived very close to his place of work. Studies also show that extended families lived next door or on the same street. In most industrial cities prior to WWI, fewer than 10% of householders were owner-occupiers. The majority of the population in every social class rented from private landlords. "The middle classes moved relatively infrequently, but when they did they often moved long distances; the poor moved often, but rarely very far; the young moved more than the old, especially at marriage, and moved further than the old, who remained within reach of younger relatives and neighbors who could help in times of illness, bereavement and poverty, and who could be helped by the old looking after the children of the young; the local-born moved less often than the migrant, especially between towns, but within them, those local born who moved at all moved further than the outsiders"
James Parker in the Illustrated History from Hipperholme to Tong (1904) includes the inventory of two homes in the area. Inventories from the home of the late Widow Firth on the township of Wike, Parish of Birstall, June 14, 1846. In the house: corner cupboard, tea table, pots of various sizes and types, clock in oak case, corn chest, plate case, close press, rocking chair, two corner chairs, three chairs, table, basket and scales, bed posts and hangings, beddings, two pillows, long bolster, two flock beds, fire plate fixtures, grates, oven, fire irons, sundries, cans, irons, tally iron, salt box, shelf, box, fire fenders, clothes horse, six tea spoons, four pewter plates, tea kettle, one ham of bacon. In the chamber: a sack of oat meal, spade and fork, box and school books, sundries, old iron, lots of sacks, bake stone, chest of drawers, flail and riddle, hedging mittons, chopper axe. In the barn: hay and straw, sundries, ladder, straw cutter, straw in the Out-Chamber, manure in yard, roller. In addition the widow had growing and cash crops of grass and oats, three cows, 24 pounds of money "in the bank" and 2 pounds cash in the house. The inventory of John Bartle, of Low Lane, Shelf Moor, a farmer, in July 1846. In the house: clock, shut-up bedstead, bedding, 3 tables, pot-case and pots, cupboard and drawers, pot rack, kettle, tosting jack, 10 chair, salt pie, fender and irons, 12 milk cans, bellows, frying pan, brass and iron candlesticks, 2 trays, tubs, bread fleack, looking glass, wights, and scales, clothes horse, gun, books. In the barn: 66 yards of hay, 4 ladders, oak chest, straw litter, hacks, hay rakes, spades and shovel, pair of single horse harrows, wheelbarrow, water tub, 3 milch cows. 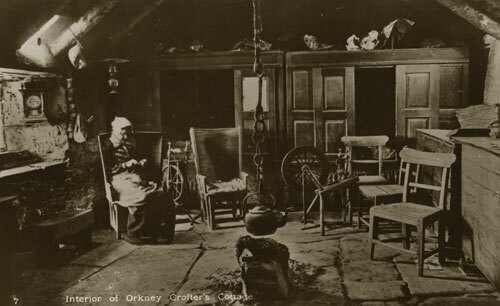 This is actually a blacksmith shop in Inkley, Yorkshire circa 1874. However, it gives a good idea of the type of construction used in houses.